Background: Nursing is an important paramedical course and is considered as an essential supplementary branch of medicine. Nurses play an essential role in the society to improve public awareness about general and oral health. Thus, the aim of this study was to assess the oral health awareness of all the final year undergraduate nursing students of Khammam district. Materials and Methods: A cross-sectional questionnaire study was conducted in all the nursing colleges of Khammam district. A total of 147 students were included in the study and they were provided with a questionnaire consisting of 26 questions which were evaluated under four categories. Data analysis was done to find the statistical significance among the variables. Results: 89.8% of the students knew how many teeth we have in our oral cavity. Many of them were not aware of proper brushing method. Regarding oral health, they had adequate knowledge on identification of disease and its relation to general health, and the effect of diet on oral health, but around 81% were confused with the identification of tooth decay. Around 51% of them were not sure about the number of visits a person should make to a dentist. Conclusion: Nursing students have adequate knowledge on basic oral structure and identifying oral diseases, but they are little confused with the method of brushing, number of visits a person should make to a dentist, and specialties in dentistry. Many have shown interest toward camps and clinical postings to improve their knowledge and serve the public. Thus, the aim of this study is to assess the oral health awareness among the final year undergraduate nursing students in Khammam, Telangana. A questionnaire-based descriptive cross-sectional study was conducted in November 2011 in which the final year undergraduate students from all four nursing colleges of Khammam district participated. Ethical approval for conducting the study was obtained from Mamata dental ethical committee and nursing ethical committee. A total of 147 final year undergraduate nursing students who gathered on the day of survey were given a self-administered questionnaire and they were given 30 min to answer the questions. All the participants in this study were girls with a mean age of 22 years. The questionnaire included 26 questions and the answers were evaluated under four categories. The first section obtained information on oral health knowledge [Table 1], the second section obtained information on oral hygiene practice [Table 2], the third section obtained information on attitude toward dentist and dentistry [Table 3], and the last section obtained information on interest to improve knowledge by attending dental camps and the nurses' interest toward clinical posting in dental departments [Table 4]. Statistical analysis was performed using SPSS version 12 software. Percentages and proportions were used for description statistics. Chi-square test was employed to evaluate significant difference between proportions. Significance level was set for P < 0.05. First section: This section assessed oral health knowledge of the students and included questions regarding the number of teeth present, initial identification of tooth decay, deposit, bleeding gums, cause and effect of periodontal disease, relation between oral health and general health, common dental complaints, and effects of diet and tobacco on oral health. Statistical significance (P < 0.05) was obtained for the responses regarding initial identificationof tooth decay, cause of bleeding gums, the common dental complaints which they usually come across in hospitals, effect of diet on gums' health, and effect of tobacco on oral health [Table 1]. Second section: This section assessed oral hygiene practice among the students and contained questions regarding ideal brushing method, ideal materials for brushing, frequency of brushing, type of brush, frequency of changing brush, tongue cleaning, and flossing. 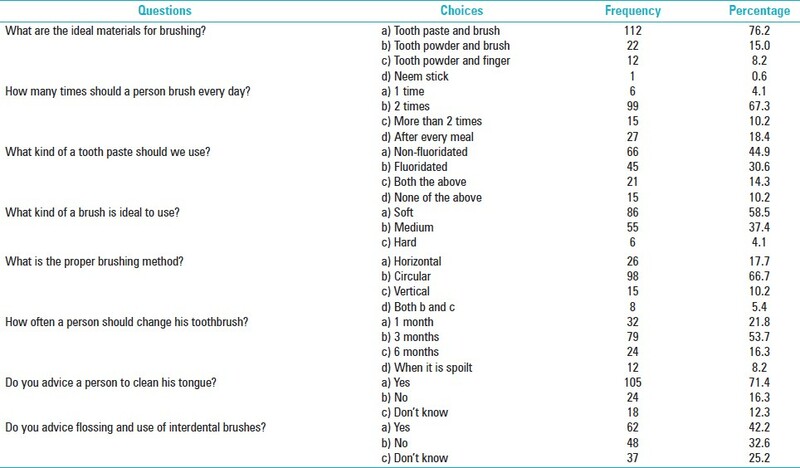 Among these, the response to proper brushing method was statistically significant [Table 2]. Third section: This section assessed attitude of the nursing students toward dentist and dentistry in which they were asked regarding the frequency of dental check-up, specialties in dentistry and their function, and their advices toward initial treatment for tooth ache and sensitivity [Table 3]. 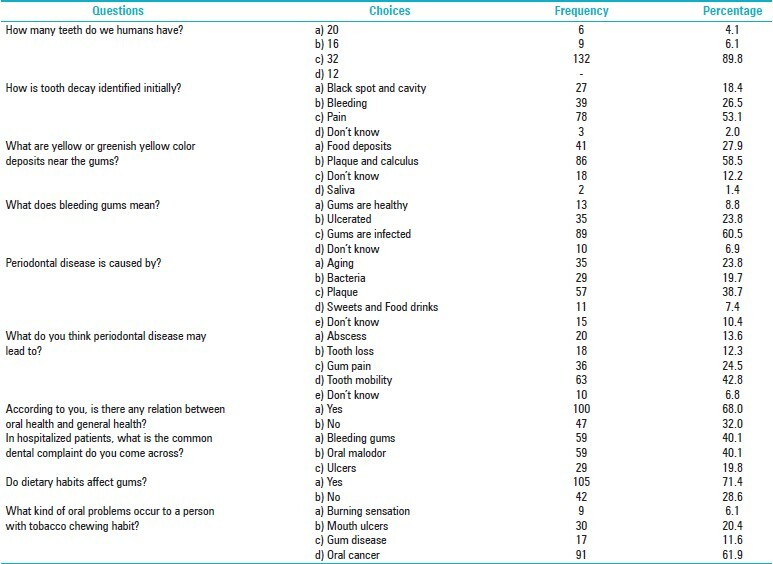 Fourth section: This section assessed the interest of nursing students to improve their knowledge and when asked whether there is any necessity for them to improve their knowledge in dentistry, a majority of them accepted that they should know more about oral cavity, oral diseases, and expressed the need for a clinical posting in dental departments [Table 4]. The response rate of all the participants was about 90%. Gallagher and Rowe stated that community nurses play an important role in the oral health care of the society, particularly among those less likely to access dental services,  and there is a need to improve their knowledge regarding oral health aspects. Interprofessional and collaborative education between medicine/nursing and dentistry is important. There exists a critical relationship between oral and general health. Thus, education of health care workers and opportunities for cross-fertilization of ideas should be encouraged. Educational institutions do play a proactive role by creating interdisciplinary opportunities that will serve as the impetus for change in health care delivery. So, a new curriculum incorporating basic topics on oral hygiene should be included for nursing students. Walid EI, Nasir F, Naidoo S. Oral health knowledge, attitudes and behaviour among nursing staff in Lesotho. SADJ 2004;59:288,290,292. Tetuan T. The role of nurse in oral health. Kans Nurse 2004;79:1-2. Rak OS, Warren K. An assessment of the level of dental and mouth care knowledge amongst nurses working with elderly patients. Community Dent Health 1900;7:295-301. Al-Beiruti N. Oral health behavior among a sample of school teachers, physicians and nurses in the Syrian Arab republic. East Mediterr Health J 1997;3:258-62. Saha, et al. Oral hygiene practice and status among health care workers in private nursing homes of Davangere. J Ind Dent Assoc 2000;71:201. Andersson K, Nordenram G, Wårdh I, Berglund B. The district nurse′s perception of elderly patients′ oral health: A qualitative interview study. Acta Odontol Scand 2007;65:177-82. Heinrichs EP, Famili P. Dental school faculty teaching the periodontal-systemic connection to medical students: A pilot mini-elective. J Dent Educ 2011;75:1370-3. Wårdh I, Hallberg LR, Berggren U, Andersson L, Sörensen S. Oral health education for nursing personnel; experiences among specially trained oral care aides: One-year follow-up interviews with oral care aides at a nursing cacility. Scand J Caring Sci 2003;17:250-6. Spielman AI, Fulmer T, Eisenberg ES, Alfano MC. Dentistry, nursing, and medicine: A comparison of core competencies. J Dent Educ 2005;69:1257-71. Formicola A, Valachovic RW, Chmar JE, Mouradian W, Bertolami CN, Tedesco L, et al. Curriculum and clinical training in oral health for physicians and dentists: Report of panel 2 of the Macy study. J Dent Educ 2008;72(Suppl):73-85. Gallagher J, Rowe J. Community nurses′ contribution to oral health. Br J Community Nurs 2001;6:526,528-534.